As the celebration of the sesquicentennial of science comes to a close and the one-year anniversary of Rev. 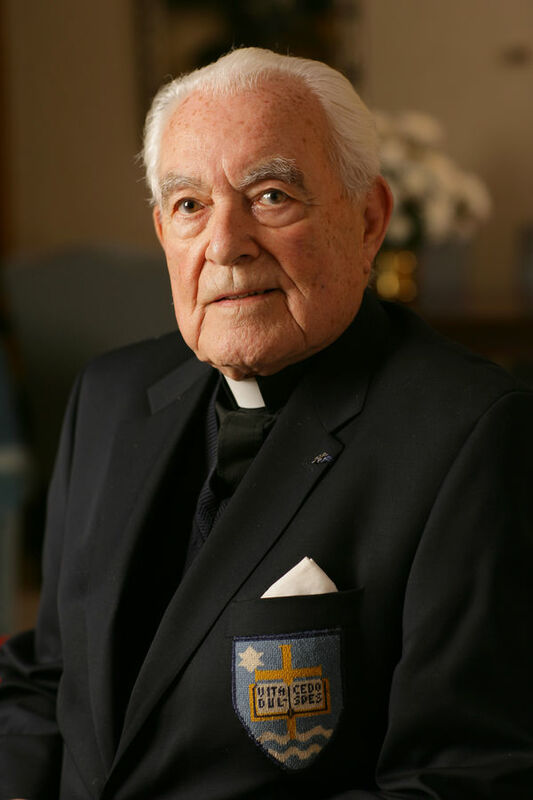 Theodore M. Hesburgh, C.S.C.’s passing approaches, the University of Notre Dame reflects on the life of Father Hesburgh and his impact on the growth and development of the sciences and scientific research at the University during his tenure and beyond. Hesburgh served as president of the University of Notre Dame for 35 years, from 1952 to 1987. During this time, Notre Dame grew in significant ways: doubling its enrollment, growing its endowment from $9 million to $350 million, and opening its doors to women. In addition, during the approximate 35-year period of Hesburgh’s presidency, research awards grew from $2 million in 1955 to $29.8 million in 1988. On this solid foundation, Rev. 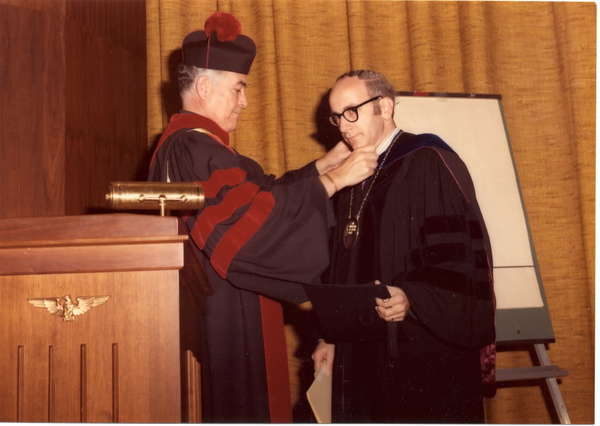 Edward A. Malloy, C.S.C., who was president of the University from 1987-2005, increased endowed faculty positions to more than 200. During current president Rev. John I. Jenkins, C.S.C.’s tenure, research awards have grown to record-breaking levels, reaching $133.7 million in Fiscal Year 2015. Trozzolo reflects on his period as a faculty member in the sciences under Hesburgh’s presidency in a new video. To watch the video, please click here. The National Science Foundation, 1954-1966: He was appointed by President Eisenhower, this first of his 16 Presidential appointments. International Atomic Energy Agency (IAEA), 1957-1970: Hesburgh served as the Vatican City Permanent Representative to the IAEA. United Nations Conference on Science and Technology for Development, 1977-1979: Hesburgh served as the U.S. Ambassador and Chairperson of the U.S. Delegation. The Rockefeller Foundation, 1977-1982: Hesburgh served on the board and as Chairperson. Many others, including the Nutrition Foundation Board, the Policy Advisory Board of the Argonne National Laboratory, and the Board of the Physical Science Study Committee. In each of these roles, from serving as a “champion of the social sciences” to helping to solve a global hunger crisis, Hesburgh believed that “being right at the heart of all the basic scientific discussions and decisions” while with the National Science Board “really changed [his] life” and he applied these learnings and inspirations back home at Notre Dame. 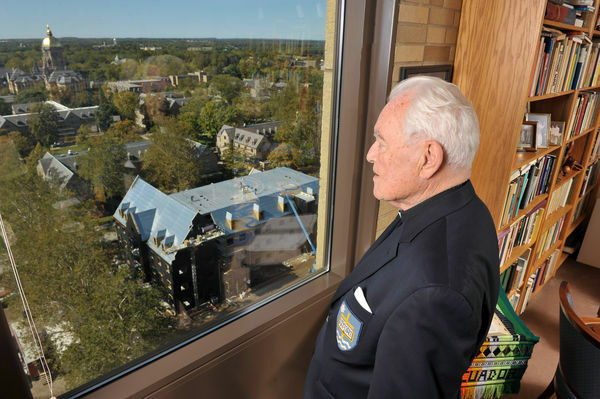 On campus, Hesburgh remained committed to growing the University, as well as the sciences, in a myriad of ways. From the dedication of the Nieuwland Science Hall in 1953 to the opening of the Radiation Laboratory in 1963, some of Hesburgh’s earliest successes in the sciences were related to upgrading, expanding, and building much-needed facilities at the University. Also included in the 40 new buildings that were built when he was president were the Galvin Life Science Center (1972) and Stepan Chemistry Hall (1982). “With the recent development of our world-class shared research facilities and the new 220,000 square foot research building, McCourtney Hall, which will enable collaborative research in molecular sciences and engineering, drug discovery, and materials science and engineering, Notre Dame continues to be inspired by and grow within Father Hesburgh’s grand vision for scientific research and discovery at the University. Our faculty and new faculty recruits continue to be inspired by the Notre Dame mission of being a powerful force for good in the world and in the sciences,” said Vice President for Research Robert J. Bernhard. The Vector Biology Laboratory (VBL), 1957: Established by George B. Craig, Jr. and a now a strength of the Department of Biological Sciences and the Eck Institute for Global Health, the VBL became a world-renowned research program in mosquito biology and genetics where, at the time, 80 percent of all genetic research on Aedes aegypti in the world was conducted at Notre Dame. The Laboratories of Bacteriology, University of Notre Dame (LOBUND), 1961: Here Notre Dame researchers pioneered the techniques necessary to produce and rear germfree animals, which are essential for immunology, bacteriology, and other biological sciences research; this work continues today through the Freimann Life Sciences Center. University of Notre Dame’s Environmental Research Center, 1968: An 8,000-acre pristine wilderness on the boundary of the Michigan-Wisconsin border, providing the opportunity for year-round field ecology research, with a focus on forest, aquatic, insect, and vertebrate ecology research, in a location protected from human disturbance. Originally published by Joanne Fahey at research.nd.edu on February 22, 2016.